You can configure the WordPress for Toastmasters software to send automated reminders to members who have taken a role (so we make sure they didn’t forget) and everyone else (so they can volunteer to fill open roles). Here’s how. Assuming you already have future meetings scheduled, the date of your next meeting should be displayed under the Email Reminders section of your Settings -> Toastmasters screen. You must be a website administrator to access this screen. You can set one or two reminders that will go out automatically, a specific number of hours or days before your meeting starts. After you have saved your settings the scheduled time of those reminders will be displayed on this screen. One goal of automated reminders is to minimize the chance that members will forget what they signed up for. If they’re on the agenda to speak, we want them to show up prepared to speak — or let us know as soon as possible if they won’t be prepared. At my home club, Club Awesome, which meets Friday mornings at 7 a.m., members get a reminder two days in advance for that reason. Optionally, you can also specify that everyone else who doesn’t have a role will get a meeting reminder that includes the current agenda and shows any roles that still need to be filled. If you have members recording planned absences through the website, they will be skipped when the reminder emails go out. The example above is from Online Presenters Toastmasters, an advanced club that meets via video-conference Mondays at 7:30 US Eastern time. Reminders are set for four hours before and one hour before our meeting time. Once you have set one of these reminders, it will go out on a weekly basis. However, the software does check first to make sure you actually have a meeting scheduled. So if you meet every other week, or occasionally cancel a meeting because of a holiday, everything should still work. You want these reminders to be perceived as helpful, not annoying, so ask for feedback from your members on the number and timing of reminder emails you send. Try to find the right balance between automation and personal interaction. The reminders can be customized for each role. I provide a default set of notification templates, which you can further customize if necessary. For example, the notifications for Online Presenters are customized to include the online meeting link. Here’s the notification you would get if you will be Toastmaster of the Day. By default, all the other role reminders also include the contact info for the Toastmaster of the Day in case the member needs to make their apologies or make a special request. If you’re signed up to speak, your reminder occurs the speech details recorded on the website (meant to nudge the speaker into filling in any missing details). The reminders that go to the evaluator and general evaluator include a listing of who all the speakers and evaluators are, along with their contact info. The idea is to make sure the members of the evaluation team can communicate with each other and with the speakers they will be evaluating. (Again, this is a default setup that can be changed). The default notification for all other roles lists the member’s role, meeting date, link to the agenda / signup page on the website, and Toastmaster of the Day contact information. If your club has a role that requires a little more explanation, you can create your own notification template (details below). Here’s an example of a custom notification for the Timer role used by Online Presenters that includes a paragraph on how to fulfill that role in an online environment. If the default templates work for you, stop reading now. Consider the instructions below an advanced topic. On the Toastmasters settings screen, you will see a link labeled “See also Notification / Reminder Templates.” You will also find a link to this screen under the RSVP Mailer menu. This screen includes notification templates for RSVPMaker event registration notices as well as for Toastmasters meeting reminders. The placeholder codes that you can use either in the body of a message or in the subject line are documented at the bottom of the page. [wpt_tod] will be replaced with the name and contact info of the Toastmaster of the Day. [officer title="VP of Education"] will output the name and contact info for the specified officer (the title must be exactly as you’ve spelled and punctuated it on the Toastmasters Settings screen). The point of the codes is to make sure the most recent information will always be displayed, since officers and meeting participants change. But you can also enter regular paragraph of text or some simple HTML (like an on online meeting link). Also on this screen is a link to a preview that will allow you to see the messages as that would be sent out to meeting participants, using real data from your next scheduled meeting. The preview of a notification to an evaluator. Tell me how all this works for you. The goal is to save time and hassle, while maximizing participation for everyone involved in your club. The clubs who use the WordPress for Toastmasters software include a mix of those who ask for volunteers, those who make assignments, and those who do a little of both to fill their meeting agendas. In any of those modes, good club leaders seek to encourage members to take on a variety of responsibilities. Now, it’s easier to see who hasn’t taken a given role, or who hasn’t done so lately. In the screen shot above, an example from demo.toastmost.org, we can see there are several people shown who have never given a speech in this club. George Washington and Teddy Roosevelt are listed as having spoken, but not since May 2017. So any of these people might deserve a nudge (or a kick in the pants, if you prefer). What you are seeing here is the drop-down listing of members in the Edit Signups view of the agenda. If I pick a name, this speaking slot will be recorded as assigned to that person. An alternative is to check “Recommend instead of assign” which will display a notes field where I can add a message encouraging the individual to take that role. They will then get an email notification and can accept with one click. This feature was added in response to a request from a club VP Education who had been spending a lot of time trying to make sure members rotated through all the available roles. 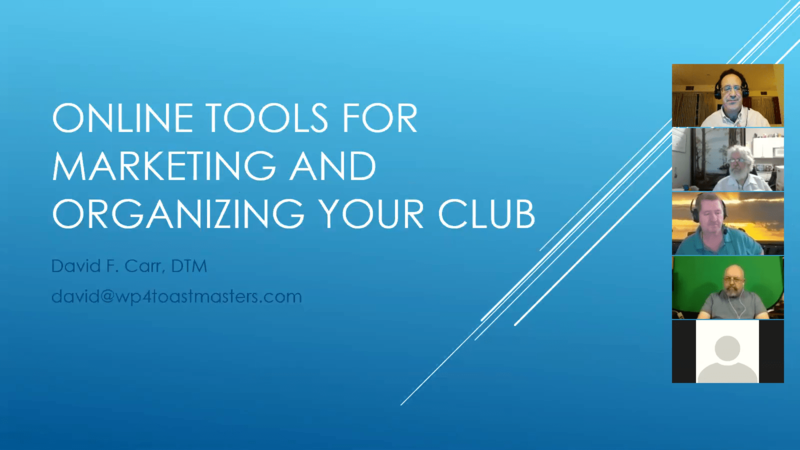 If you have ideas for features that would make the software more productive for the operations of your club, just ask, and we’ll try to make it happen. After seeing this history displayed in the dropdown list, my friend Roger Fung, VP of Education at Online Presenters, asked for a report where he could see all this data shown side-by-side.